Finally – a set of Alex “Adventurer” rims to get be safely across the tough roads ahead. 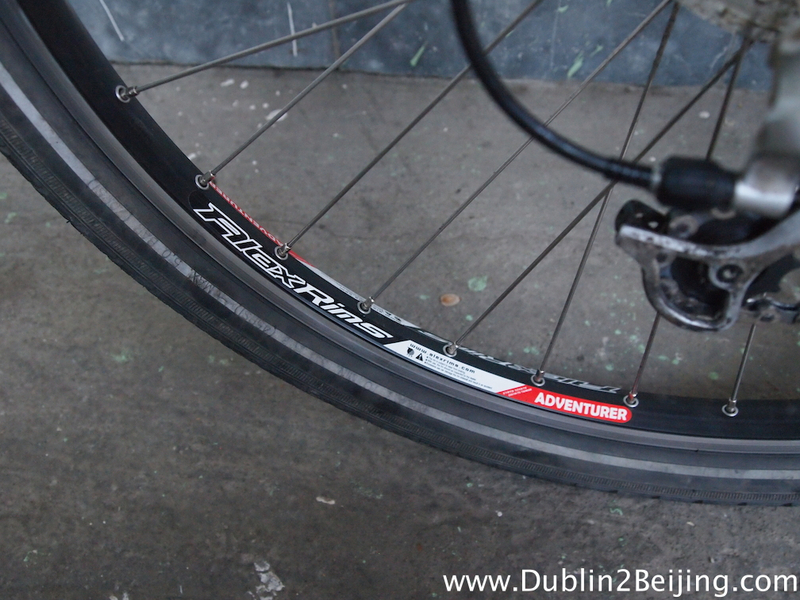 It boils down to this: I asked several Irish bike shops for help sourcing the rims. Only one replied and said they’d source them, then courier them to Georgia for the shop to rebuild my wheels. Five days after they said this, I’d heard nothing and had to email twice, only to be told firstly the rims were on their way, and then the worst news: We can’t get them. I ended up sourcing them from the US via eBay! It sounds like a water under the bridge thing, and I really should forget it, but each extra day in Tbilisi meant I lost a day in Uzbekistan due to the visa being date specific. The same applies to when I lost the bank card – the bank told me a replacement was issued, but two weeks later there was no sign of it. Those two delays have really frustrated me to the extreme, and when I’m knackered on the bike, I really just want to scream at how frustrating these two events have been. I’m now almost 1500km behind where I wanted to be, and it had nothing to do with me: Injury, laziness, fear of wild dogs etc… all down to me, but when it’s out of my hands…..AAARRRRGGGHHHHH!!!! Anyway, rant over. That felt good. The reason for the rant is when I left Tbilisi, I felt rubbish. Truly rubbish. My stomach was in a knot and I couldn’t cycle 10km in one burst. I felt every single metre that day. I put it down to nerves about the visa dates and the frustration with the rims, and of course tiredness on the bike made things worse. I blamed the bike shop and the bank for my fitness falling away while I was in Istanbul and Tbilisi, and suffering on the bike just made it worse. I had made plans to meet Will in Lagodeghi, the last town near the Georgian border, 150km away, but could only muster 110km that day, and that was a serious challenge. I put an update on Facebook that I hadn’t felt as bad since Belgium, 5500km ago, and I meant it. I just felt like my legs had never turned pedals for more than five minutes. Something beyond nerves was wrong with me. I pulled into Singnaghi, 40km short of target and was put up in “Nato and Lado’s Guesthouse” – Lado had found me on the side of the road lying under a tree earlier in the day and knew by the state of me I wouldn’t make Lagodeghi. He gave me his card and promised me a good stay at their guesthouse. He neglected to mention it was about 800m up the side of a mountain. I only found this out the hard way on the way up! I was feeling rubbish and this didn’t help. Anyway, I made it and Nato and Lado were excellent hosts. 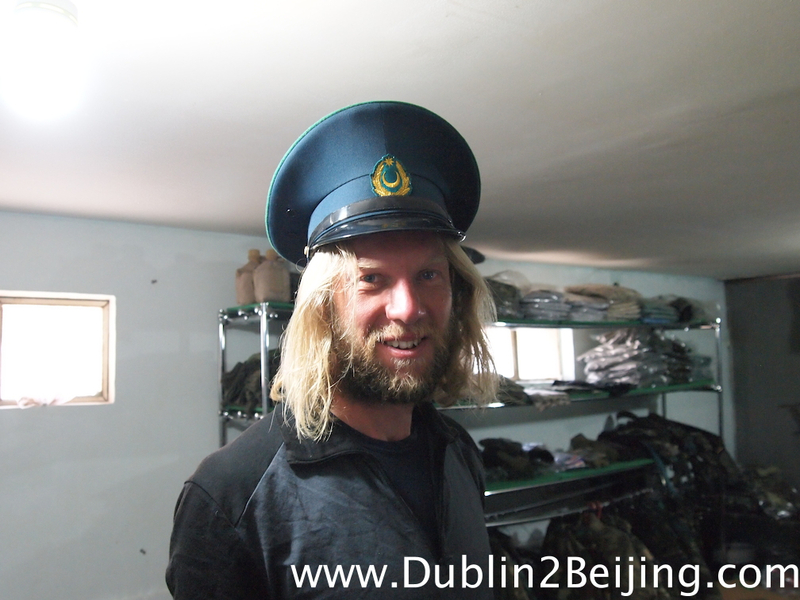 Probably too good as they fed me and gave me copious amounts of homemade wine and “Cha Cha”, the local moonshine. I made it to bed at 10pm with my stomach feeling ropier than before. 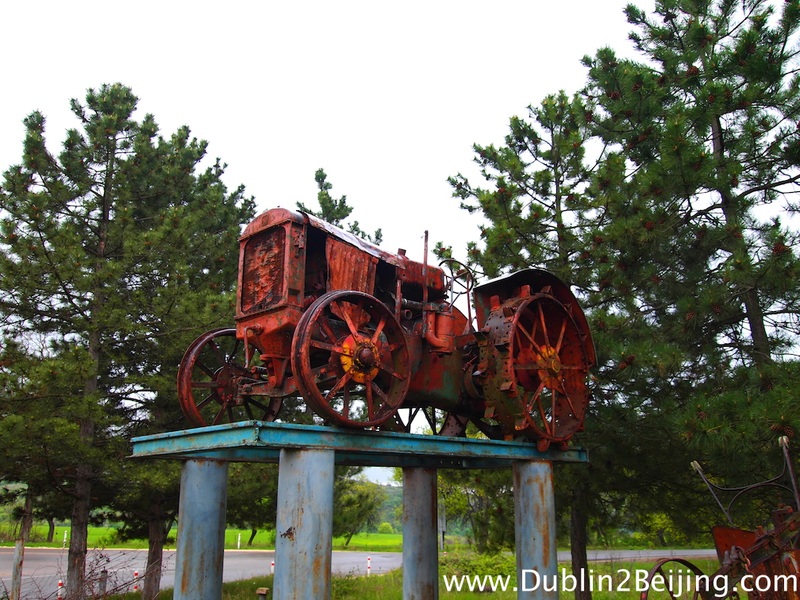 I still stopped for the odd photo – I thought this tractor outside Sighnaghi was kinda cool! 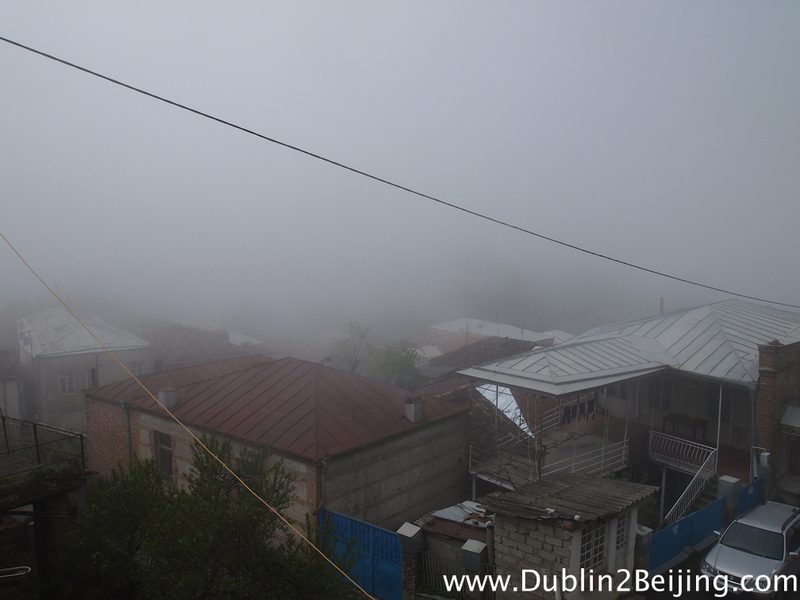 I arose the following morning with a hangover and a storm pummelling the guesthouse. At that altitude (not that high really), the clouds had covered the town entirely, so the narrow road out wasn’t safe to cycle as the Georgian drivers are fairly crazy. Add 5m of visibility in thick fog on a steep mountain road. No thank you! I left at noon as the weather cleared a little but I was still in bits. The hangover certainly didn’t help. It was raining. It was cold. The road was in a bad state of repair. I was not having a good time! Past Lagodeghi I crossed the border into Azerbaijan. I tried to remain optimistic and happy entering country number 17, but I was just feeling awful. I awoke to this view from the guesthouse in Signaghi. Good Luck? I felt like I needed it. My stomach was in a bad aul way entering Azerbaijan. Don’t smile at an Azerbaijani in the street, because if you do they most likely will not respond in kind and they will regard you as odd. Smiling in Azerbaijan in public is not done and will be considered inappropriate. All I can say is that this is complete rubbish! 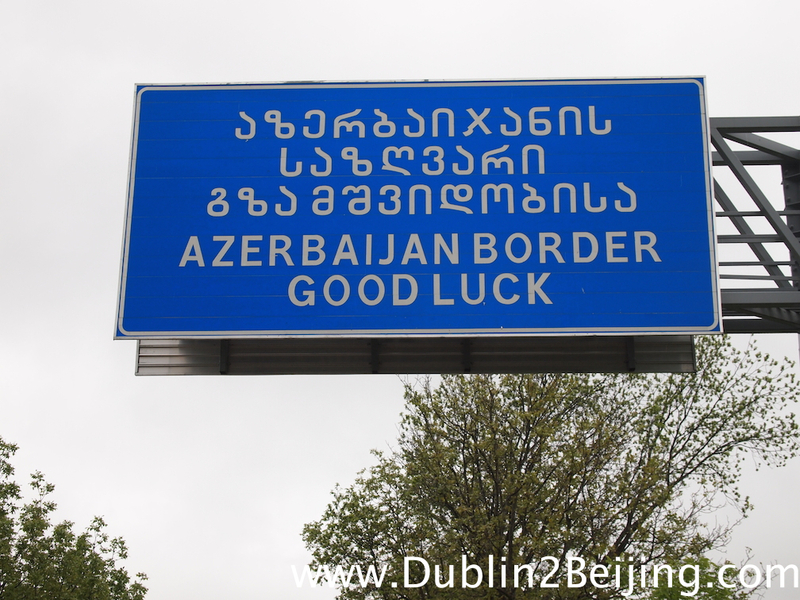 I must’ve passed more than a thousand smiling and waving Azeris over the past 450km! They’re incredibly friendly and hospitable. This did a lot to raise my mood, but I was still in a bad aul way. I aimed for Zaqatala, 90km from Signaghi and for the first time on the trip I counted down the remaining 10km of the day in steps of 100m! I felt so rough that 100m was a challenge. I had no energy and the I was losing the battle with the road. Something wasn’t right. 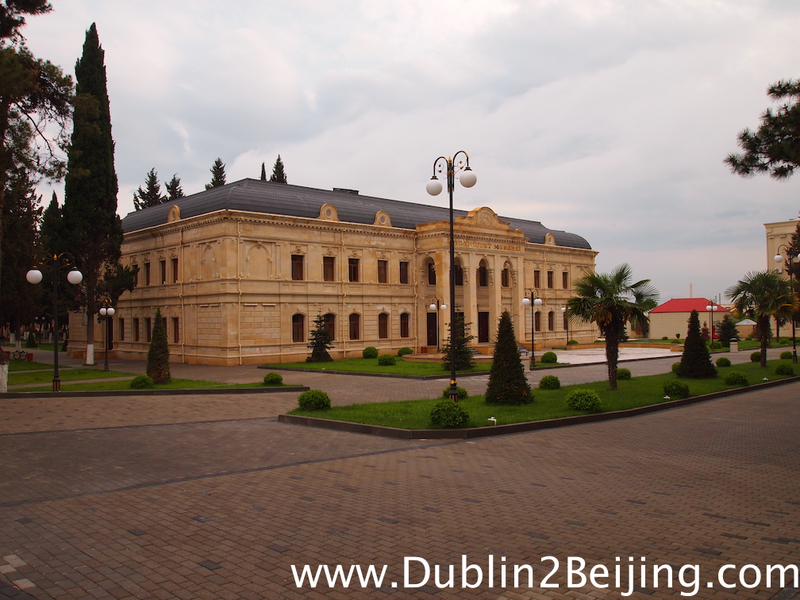 I checked into the cheapest hotel in town (not that cheap, Azerbaijan is expensive! 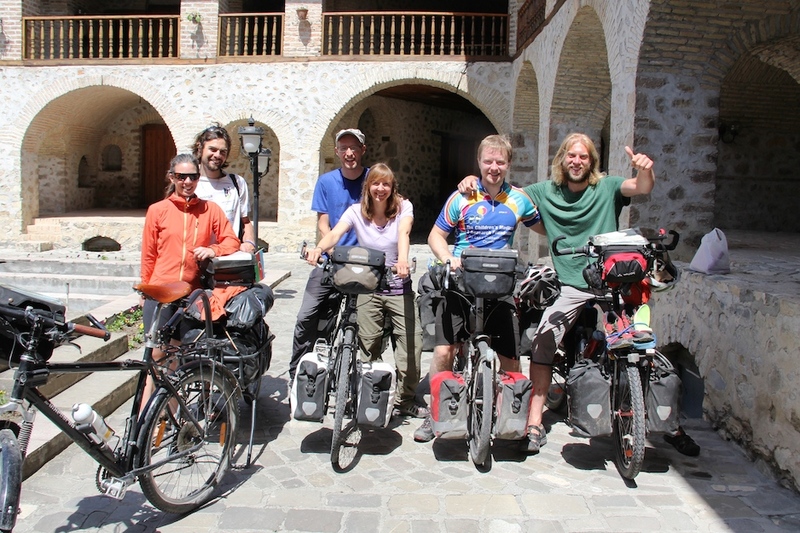 ), and met Beat and Miriam, from Switzerland, who were backpacking around the region. They were headed to Sheki the next day, as was I so I told them of the cheap (again, not so cheap) Caravanserai in Sheki where I planned to stay. Balakan, Azerbaijan. The Azeri towns were nicer than Georgia. Clearly more wealth here. Serbs: Mild “bip”, hello, I’m behind you. Just letting you know. Turks: Louder beep, but not so common. Georgians: Beepity-Beep-Beep on every 3rd or 4th car. Manageable. Azeris: BBBBBEEEEEEEPPPPPPPPP BBBBBEEEEEEEPPPPPPPP BBBBBEEEEPPPPPPPPPPPPP BBBBBBBBBBBBBBBEEEEEEEEEEEEEPPPPPPPPPPPPPPPP!!!!!!!!!!! From every second car. Maybe even more frequent. Holy crap. It grinds on you very very quickly! A typical Lada hurtling down the main road in Azerbaijan, oversized load on the roof and blaring his horn at me. I can confirm the horns on Ladas work really, really well. Sooo…a grumpy, tired and sick Stephen crawled along the main road and then up to Sheki, another mountain town and I decided that I needed a day off. A day off!!! After just 300km?! I wasn’t happy with it, but I was a day behind and the Uzbek Embassy wouldn’t be open again until Friday so I had nothing to gain by pressing on. That evening I got an email from Will. We hadn’t crossed paths on the way as planned so I was hopeful he’d be nearby. 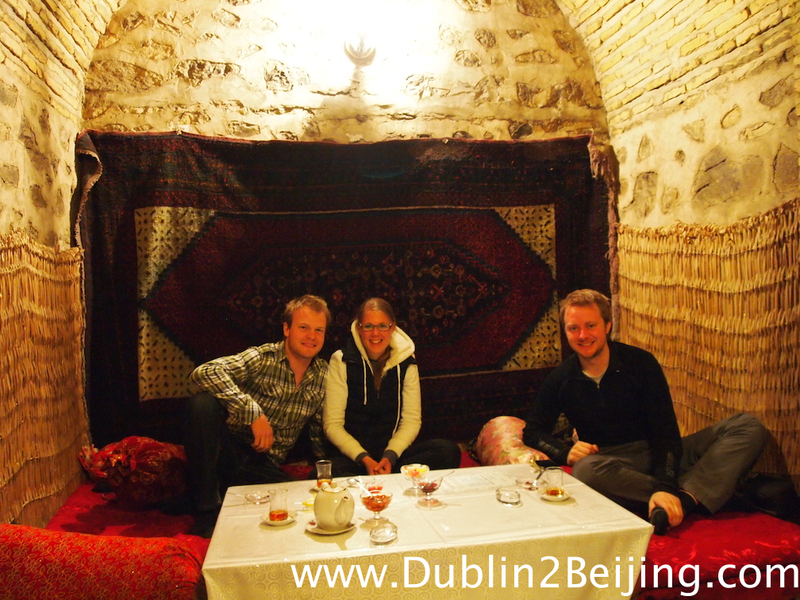 As it turned out he was in Sheki too….in the Caravanserai….in the room next to me! What a coincidence! Then it turned out there were four other cyclists staying there too: Two Germans and two Belgians! The Belgians were also feeling the visa pressure and were taking a bus to Baku. I half considered joining them but I will only take public transport if absolutely necessary (wild dogs included!). Ahhhh Will. My cycling fwend! 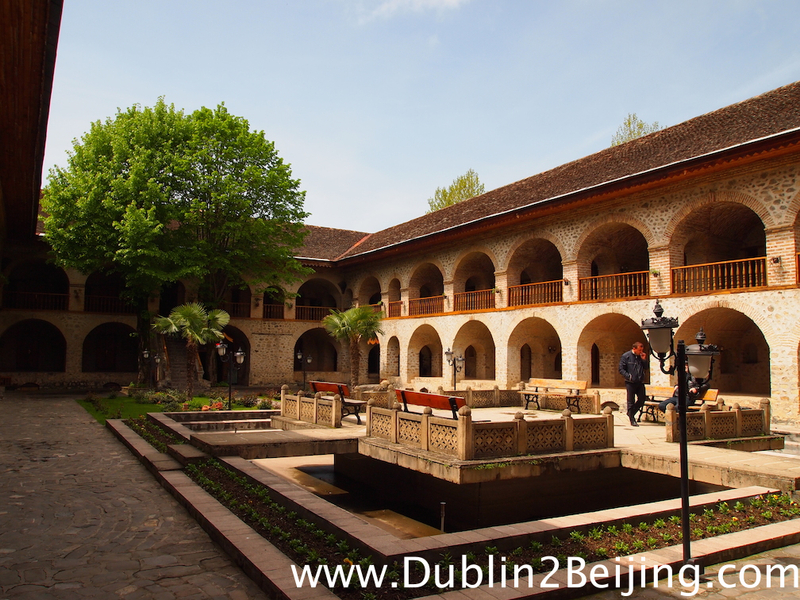 The Caravanserai in Sheki was a very atmospheric place to stay. Lovely. It turns out you need to register with the local immigration office within three days of arriving in Azerbaijan, so Will and I headed off to do that the next day. 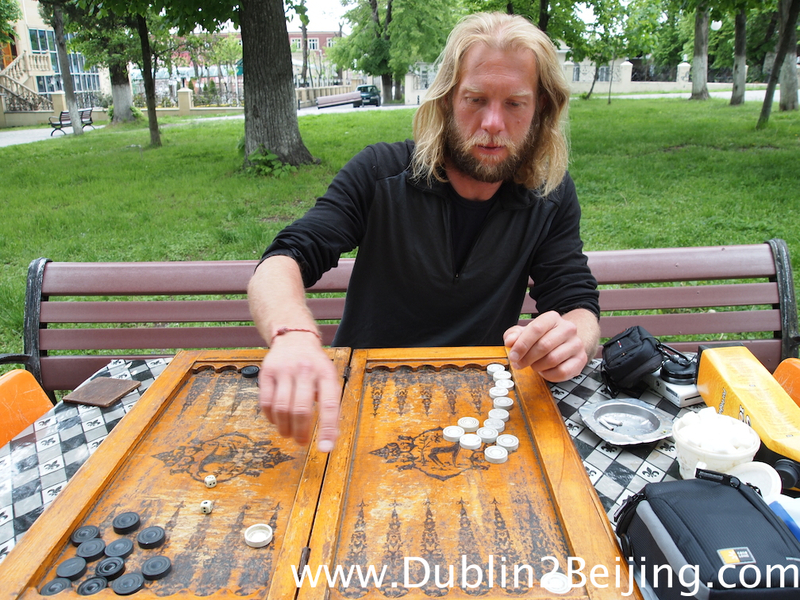 We then played backgammon (our own version as we didn’t know how to play) while drinking tea in the park – very Azeri altogether, and then met Stefan and Kira for dinner. The next day we had a massive breakfast together in the Caravanserai and met another cycling couple, from Canada and France, who were just visiting the Caravanserai. 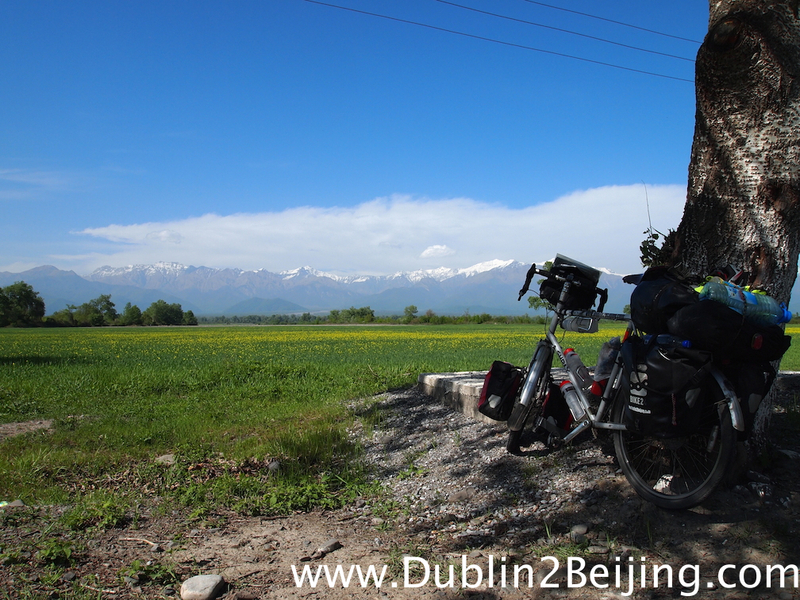 Sheki was a hub of cycle touring activity that day! Everyone was heading in different directions though, so I set off at 2pm, much later than planned! The taxi journey to the immigration office was even more terrifying than sharing the road with the crazy Azeris. They’re far worse than the Georgians! Backgammon and Tea: A very Azeri past time. Shame we didn’t know how to play! I was sad to be leaving the guys, but my stomach bug was gone and I felt much stronger on the bike. Despite leaving at 2pm, I made a healthy 90km to Qabala. The sun was out in force and the views were magnificent. On the way I was called over by some older guys who shared their lunch and of course, offered me wine and vodka. I really should have camped that night, but Qabala is another of these towns halfway up the mountain and when I got there to pick up food for dinner I felt lazy and checked into another hotel. Of course 5 minutes off the bike and I wanted to be camping out on the hills. Typical! The view of the Caucasus mountains was never ending and beautiful. 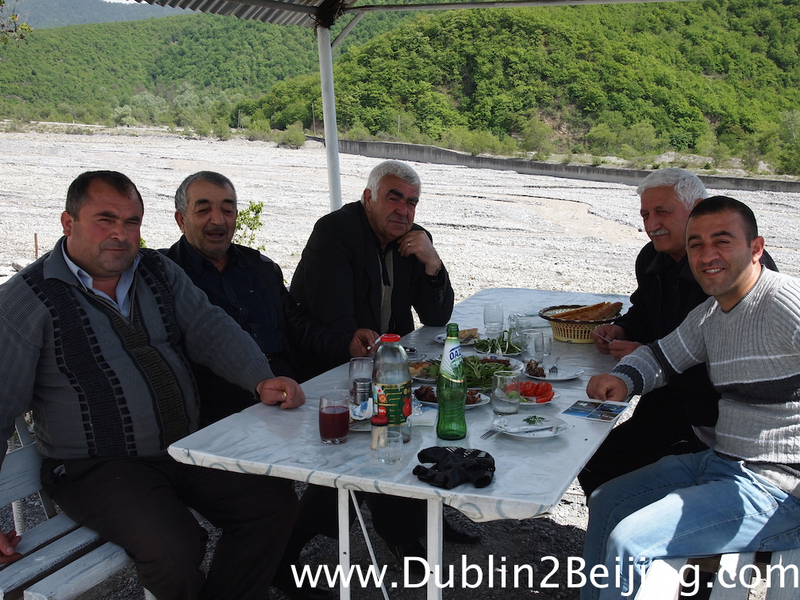 I stopped here for some lunch on my way from Sheki. Just lovely. These nice guys gave me lunch and refused money. This happened a few times in Azerbaijan. Lovely people, very hospitable. Out of Qabala and I set off to do 110km of the remaining 230km towards Baku. I knew it would be hilly but my-oh-my, what a day! The heat was in the low 30’s and the hills hit gradients of 15-20%. At one point I only covered 2km crawling up a hill for 45 minutes but gained about 400m in altitude! That’s 20% on average. Toughest hill I’ve ever climbed, that’s for sure! The hills slowed me down and I was losing sunlight fast. 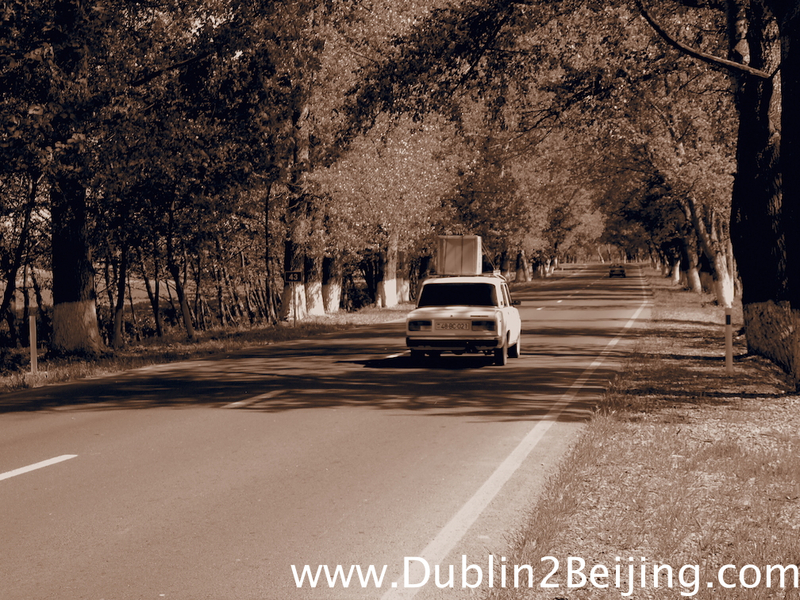 The road was just surrounded by flat fields with nowhere to hide a tent. I pushed on and saw a restaurant. I figured I’d buy my dinner there and see if they’d offer me somewhere to sleep or put up my tent. Hang on. Does that say “Motel” – why yes it does! Okay, it was a bit of a dump, but I was happy to find somewhere to sleep, even if it wasn’t cheap. 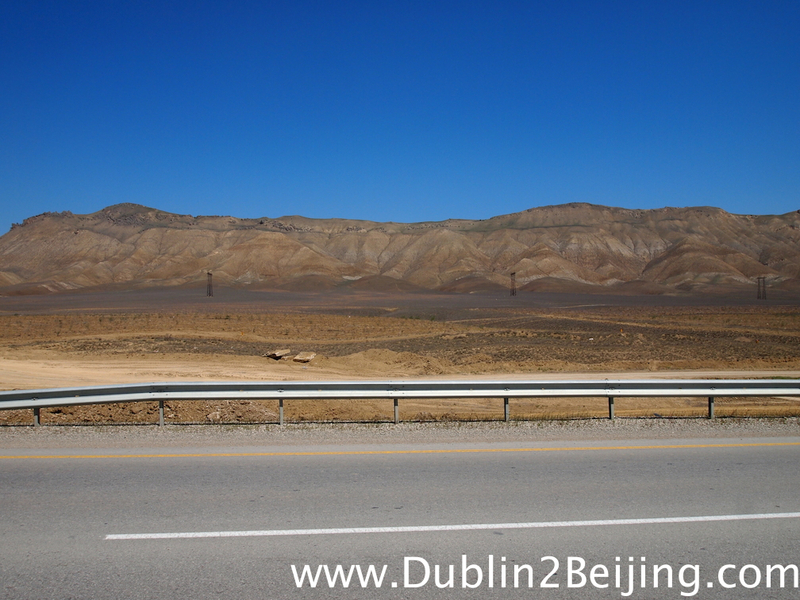 The next morning I set off towards Baku and my choice to take the Motel was confirmed – nowhere decent to camp for the next 15km and over some big enough hills. I’d never have made it before the sun went down. The road to Baku was a mix of the different worlds of Azerbaijan. Azerbaijan is apparently home to 9 of the 11 Climate Zones, and I certainly feel like I’ve cycled through a good few of them. 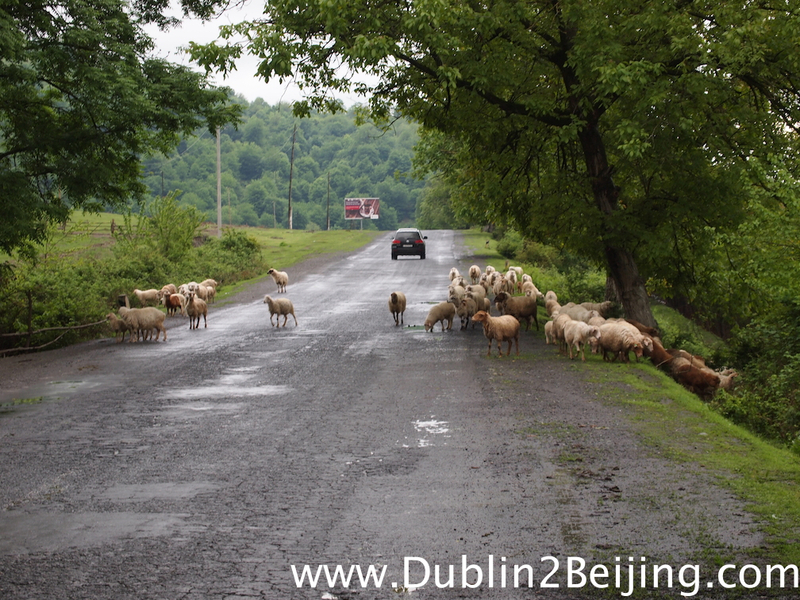 Past the border, it was like cycling in Ireland: cool, wet and green. Then it got warm, humid and very green – like cycling in the jungle. Then it got dry and I entered the semi-desert on the way to Baku. It’s been surreal passing along the Caucasus mountains, then out into the desert, and then into Baku. The semi-desert on the way to Baku. I had a lovely tailwind for the first 70km to Baku, and I even hit 77kph coming down a hill like a motorbike racer, zipping around s-bends and leaning into the corners. The wind helped keep me cool as the temperature hit 35 degrees. The tailwind became a headwind for the last 40km into the city, and combined with the crazy driving and the never-ending beeping it was tough work, but I made it! 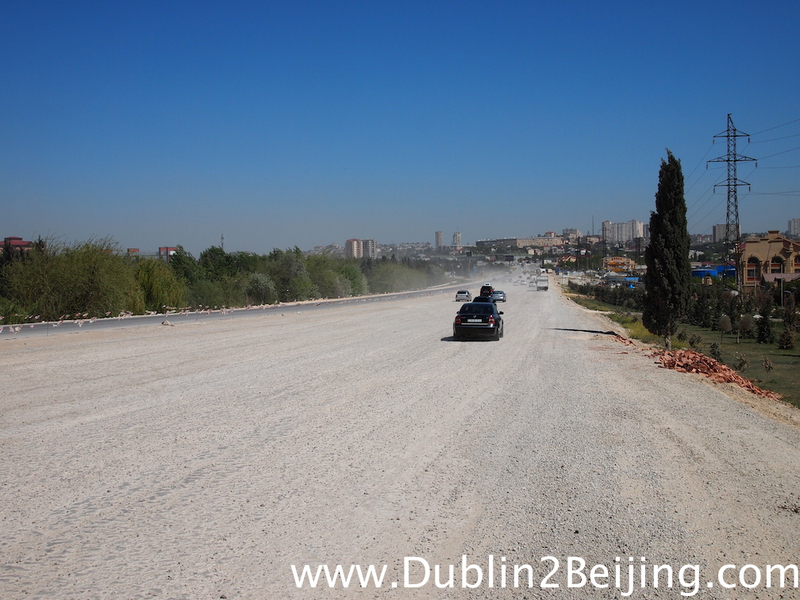 This was the main road into Baku for about 1km. Combined with the wind and the crazy drivers it was a challenge in itself! So now I’m back into visa mode. I need to get to the Uzbek Consulate first thing in the morning. Hopefully with my LOI I can get the visa tomorrow and then commence the waiting game for the boat to Aktau in Kazakhstan. It’s a boat with no timetable and apparently getting a ticket is a real trial, so we’ll see how this goes. 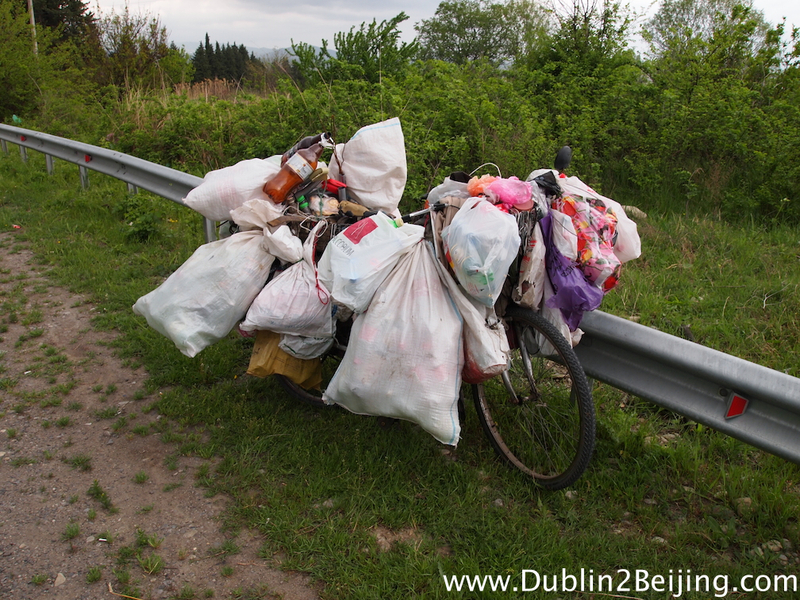 Just another week trying to cycle to China! 1 Response to Tbilisi to Baku: Salam!